FIND THE PLACE WHERE YOUR DEEP GLADNESS AND THE WORLD'S DEEP HUNGER MEET. At Northminster, we have more than a comprehensive list of ministries. We have a combination of reliable and sustainable ministries, and we have others that are still emerging. We believe that there are many more that are yet to be. The heart of the ministry of our church is in the lives of our people. You can find them spread out across the Puget Sound and beyond through out the week. This is really where our ministry is happening. We strive to support our people as they live out their mission throughout the week. There are various entry points that are provided as a way of joining the our work and our ministry. Your best bet is to check out our current events or to read through our newsletter to see what's happening this week. You'll get a taste of what is going on and where to jump in. We have a Sunday School class that meets following the Children’s Sermon in woship. Many families choose to remain in the service together. Our balcony is equipped with toys and coloring items to keep young hands engaged during worship. We have Sunday School for kids of all ages. Middle and High School students are encouraged to say in worship, but are welcome to attend Sunday School as well. We aim to support our children to lead the congregation in worship. Children are welcome to join the congregation as Readers or as Worship Leaders. In our Sunday School classes, we use a curriculum that engages our children in a personal faith while still maintaining a commitment to the large biblical story. Middle School Youth Group (grades 5 and up) meets on Wednesday Night at 7pm, after the Community Night Meal. COMING THIS AUGUST! CREATIVE CAMP RETURNS August 26-29 9am-1pm. Stay Tuned for more details! When we eat together, we share our lives. Body and mind are nourished from this simple supper. We welcome families and neighbors, those who call Northminster home and those who are opening the door for the first time. Meal service begins just after 6pm on Wednesday nights and finishes by 7pm. Dinner have you wanting more? Stay from 7-8pm for Adult Formation opportunities and Youth Group for kids 8 and up. Composers, vocalists, and instrumentalists all find a challenging and enriching musical life. 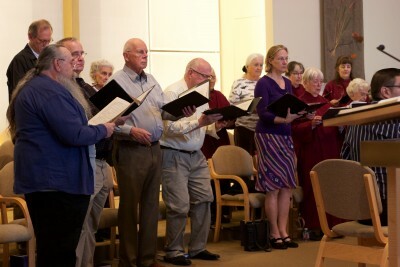 Our choir sings a wide variety of pieces and embraces the musical diversity of our faith heritage. We welcome all levels of experience at all life stages. We believe that singing is a formational practice. It integrates the themes and messages of worship and it shapes the one who is making the music. Our organist, Eric Johnson, leads worship with beauty and conviction.